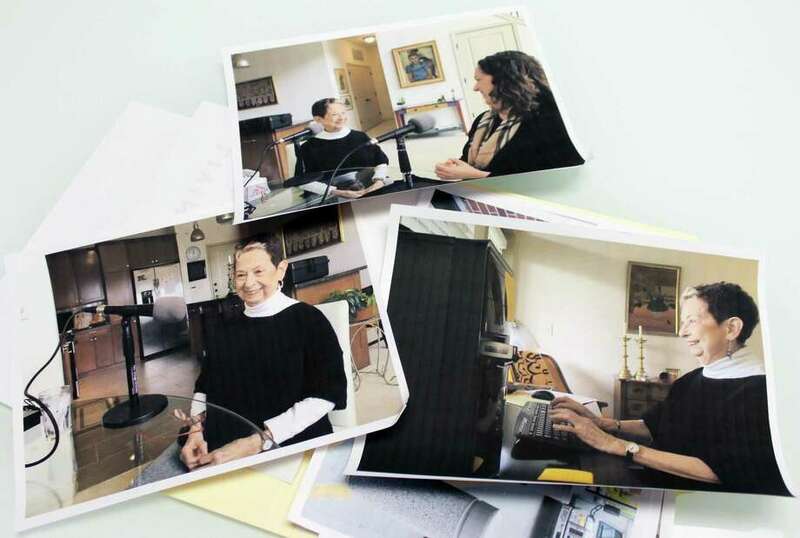 Photos of longtime Westport resident Joan Blumenfeld during the filming of "Living With Palliative Care." Clips of the film will be shown on Oct. 4, 2017 at the Norwalk Inn and Conference in Norwalk, Conn.
Laurie Blumenfeld describes her late mother, Joan, as a firecracker. Joan, a former Westport resident, was a competitive ballroom dancer and world traveler. She took weekly ballet and Pilates classes and worked at her own elderly care management firm through her eighties. Blumenfeld stayed active even after she was diagnosed with Stage IV lung cancer in August 2016 at 84. She didn’t slow down until a couple months before her death at 85 on July 22, 2017. Even after her death, Blumenfeld’s spirit remains active. On Oct. 4, the Connecticut Geriatrics Society will host “Living With Palliative Care,” an educational program based on a documentary of the same name following Blumenfeld’s end of life journey. The film focuses on the last several months of Blumenfeld’s life and the significance of palliative care, which focuses on the physical, emotional and spiritual needs of someone diagnosed with a serious illness. The movie came to be with the help of Connecticut-based gerontologist and Blumenfeld’s longtime friend, Donna Fedus. Fedus and Blumenfeld met when Blumenfeld was a student in a course on aging Fedus teaches. The two became friends and worked together to educate others about aging and elderly care. When Blumenfeld was diagnosed, she began a form of treatment that sent her into kidney failure. Once she recovered, she told Fedus she wanted to use her experience to educate others. “I’m recovering and full of ideas for how to use this nasty experience in the most constructive of ways,” Blumenfeld wrote in an email to Fedus. Fedus and Blumenfeld worked on guest lectures and continuing education programs about Blumenfeld’s experience. Fedus also reached out to her sister and film producer Lauren Lewis about documenting Blumenfeld’s journey on film for when her disease prevented her from teaching. Sue Sweitzer, a good friend who worked in palliative care, also joined the team. “Living With Palliative Care” started filming in March. It shows Blumenfeld’s journey from the perspective of herself and her family. There are scenes with Blumenfeld’s doctors at Norwalk Hospital, as well as the chaplain there, Kaye May, who later officiated Blumenfeld’s funeral. There also are shots of Blumenfeld meeting with her three children, as well as her ruminations on life in the month before she died. Fedus said she learned a lot about palliative care while following Blumenfeld’s journey, including how insistent some medical professionals can be in pushing curative treatments. Blumenfeld knew she didn’t want curative treatment due to concerns over quality of life. Still, she and her doctors had to push against treatments like swallowing a camera to find the source of a gastrointestinal bleed. While many patients want treatment to extend their lives, Blumenfeld’s care focused on pain and symptom management. A huge part was spiritual and emotional. Blumenfeld, who identified as Jewish, spoke to a chaplain at the end of her life to help understand her life’s journey and her spirituality. Blumenfeld also tended to her emotional needs by having her three children around her before she died. Laurie Blumenfeld said her mother had 24-hour, in-home care so her children, Laurie, Eric and Karen, could focus on family time instead of caring for her. As a result, Laurie Blumenfeld said her family was “closer than ever” during her mom’s final days. “Living With Palliative Care” is in post-production, but clips will be shown at the Oct. 4 program at the Norwalk Inn. Fedus hopes the film will be finished by the end of the year. It’ll be used to educate patients, family and medical providers about palliative care.